Home » The Globe » It's All Shakespeare! – The Globe and its Festival. Who would have thought that the fast horses, winning jockeys and elegant ladies you usually see on a racecourse would, once a year, have to make way for the 100% pure pleasure of theatre. It's a well-known fact that in Neuss many things are “a little different“. The visitor to the spacious city-centre racecourse in Neuss catches a sudden glimpse of an unusual, twelve-sided building with black and white shutters at its windows, standing under high poplars, between betting-hall and enclosure: The Globe. This unconventional theatre – a construction of several storeys made of wood and steel – has stood on this site since 1991. There are more than 500 seats, and the seating is as unconventional as the building itself. The audience sits close up to each other in a half circle on three different levels, the actors on the stage seem near enough to touch. It is almost as if the audience is being asked to play a part, something which in fact does happen from time to time. So the visitor to the Neuss Globe is never safe from (of course only pleasant) surprises. In short: theatre here is a real experience! 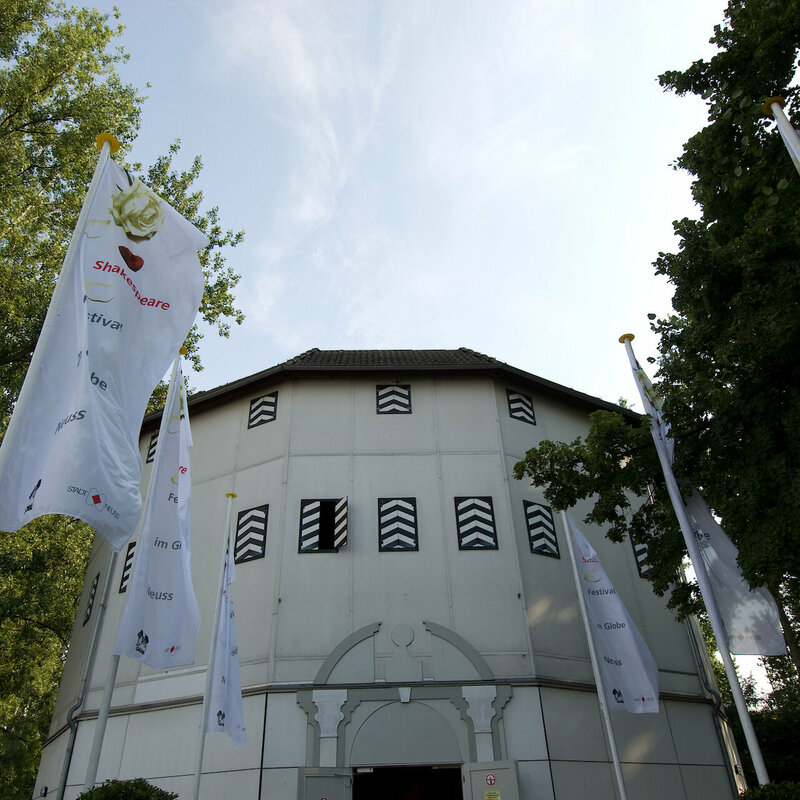 The Shakespeare Festival, which takes place annually in the early summer, is unique of its kind. It is organised by artistic director Dr. Rainer Wiertz, head of the cultural office Harald Müller and his crew and enjoys generous financial support on the part of its main sponsors Sparkasse Neuss and the “Friends of the Globe“. Fans of Shakespeare's dramatic, turbulent, witty plays make the journey to the Rhine from all over Germany and are inspired by the atmosphere. It's relaxed and uncomplicated and the theatre companies from all four corners of the world contribute to this, bringing international flair to Neuss for four weeks of the year in June and July. Whether from Zimbabwe, Italy or France, Switzerland, the USA or – naturally – Great Britain: companies such as “Over the Edge“, “Compagnie Casalibus“ or “The Watermill Theatre“ awaken our curiosity by their very names. What kind of magic will they work on stage? Creativity is of an essence, as the directors often have to do without complicated sets. Very much in the true spirit of Shakespearean theatre, it is rather the art of the actor which takes centre stage here. Their language, gestures and expressions, the costumes, the effective lighting and – last but not least – the theatre itself, in all its challenging simplicity, come together to create what can be called “typically Globe“. Spot on! Whether it's Romeo and Juliet, Romeo et Juliette or Romeo e Giulietta, in which language do the lovers' oaths sound most beautiful? Perhaps in German, because, German theatre companies are, of course members of the inner circle of the tried and tested “Globe people“. 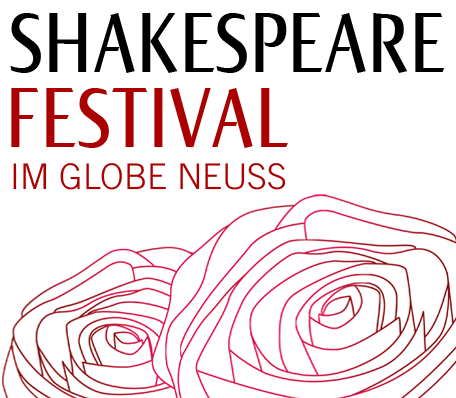 The performances of the Bremer Shakespeare Company, with which the whole festival actually began, are legendary. This is a festival which, by the way, is not limited to just the stage. 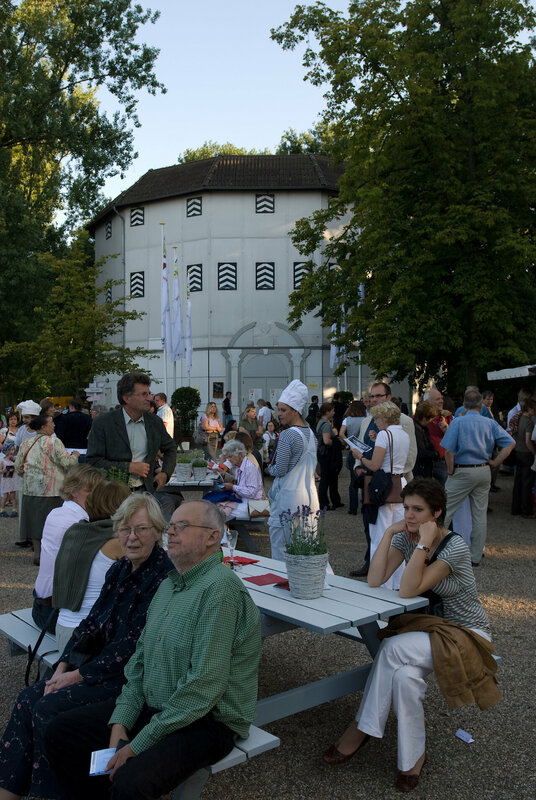 It extends out into the welcoming (Shakes)-beer garden and into the truly dreamlike world of the transformed, candlelit betting-hall, where actors, Neuss theatre people and guests happily carouse deep into the night. It was no doubt no different 400 years ago in Elizabethan London. In the Wooden “O“, Shakespeare's Globe, food and drink were a natural complement to the pleasures of eye and ear.